Show loved ones you care by gifting them with this handmade heart soap with Valentine Day duck sitting on top. Love is in the air with these pink and white guest soaps! 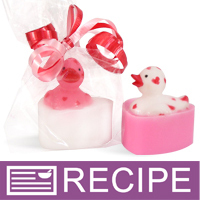 The base of this product is a heart-shaped guest soap bar; cute mini heart-covered duck sits on top. These lovely soaps are wonderful Valentine’s Day gifts and are perfect for your January or February craft show! Attract customers to your table with the sweet smell of blackberries, goji berries, loganberries, and gooseberries. You Save $47.15 by purchasing this kit rather than buying the items separately. COMMENTS: My customers loved these little soaps. I modified the kit and used a different fragrance, but that didn't shoo my customers away,they told me the fragrance I used was just right and smelled wonderful. I used Sweet Pea Fragrance 308.